We provide complete Traffic Management solutions designed to keep people safe. From one-day events to long-term construction projects, if you have activity happening on or near the road, Men at Work's great people will come up with an efficient plan, and put it into action safely. When any kind of road works are planned, we work hard to minimise disruption and help keep traffic flowing. 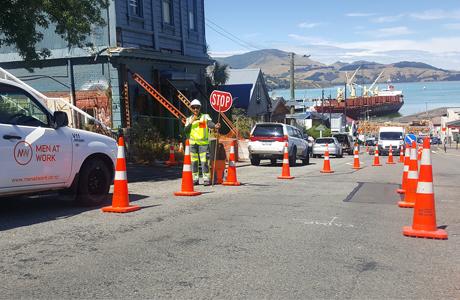 From overhead line work to under road infrastructure, we have lots of experience executing traffic management plans in and around busy city environments. During the initial growth of the company, there were limited qualified people available in the industry. We have grown our position as market leaders and specialists through the in-house development of our Training Programmes and associated intellectual property. Whenever there's an event there's an increase in population and activity around it. The potential for hazards is high, not only for participants of the event, but for traffic in the surrounding areas. For Men at Work, safety is the real name of the game. 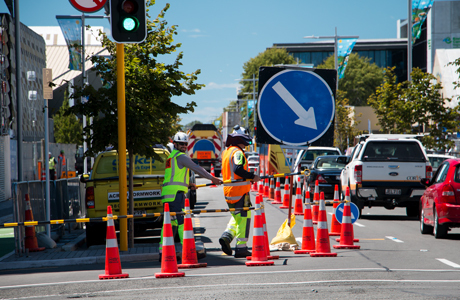 Our customised Traffic Management Plans (TMPs) allow us to identify and manage any risks before work begins. We always strive to surpass regulations, something made apparent by our incident-free safety record. Providing complete Traffic Management solutions designed to keep people safe.